Launch Recruitment is celebrating reaching the 5000 follower milestone on LinkedIn. From the start, the Launch aim was to create a company based on strong values and has grown a great work environment. Launch has traded profitably since the start (in 2006) and have achieved their success with committed, professional staff and a culture of giving and social responsibility. 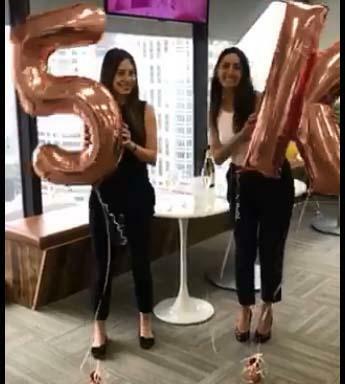 This is a huge milestone for the Sydney CBD-based recruiter, which has provided recruiting services to companies in Project Services, IT Sales and Marketing, Infrastructure and Cloud, Digital, Telecommunications, Software/Application Development, Security, Business Intelligence/Analytics and Emerging Technology. For the last 13 years, the Launch team has placed permanent and contract staff across a range of role types. Launch Recruitment got it’s start in 2006 when founder Rebecca Wallace saw a need for high quality, candidate focused recruitment that values staff, clients and candidates equally. One of the earliest challenges Launch Recruitment faced was establishing a presence in both Sydney and Melbourne in order to cater to the major capital centres of Australia. With the creation of the Brisbane office, Launch takes care of employers throughout Australia and in particular NSW, Victoria, South Australia and Queensland. While every business faces challenges, some, like Launch Recruitment are fortunate enough to enjoy real successes, wins and victories too. One such victory came when reaching the 5000 follower milestone on LinkedIn recently. LinkedIn is an important resource for all recruitment companies, candidates and employers as a way to connect, share jobs and knowledge. Having such a huge following is definitely a significant milestone to have reached and is worth celebrating. Launch Recruitment currently consists of over 100 employees and has big plans for the upcoming year. One of their core objectives is their focus on gender diversity for both candidates and employers. Recent blog posts attest to this focus on taking gender bias out of the hiring process and encouraging gender diversity in the workplace. The Launch team know they have the ability to bring positive change to employers and companies who seek to hire special people to grow their business. As recruiters, we know that our efforts can have a lasting impact on the career and lives of the people we place and we do feel a responsibility for candidates’ and clients’ future happiness and work satisfaction. Launch Recruitment would also like to thank friends, customers and all its partners for their well wishes on this happy occasion.